The barrier islands of the Gulf Coast are an important defense against hurricanes. Mostly uninhabited, they are the first landforms that a Gulf Coast hurricane strikes. While they do not weaken the hurricanes (they aren’t large enough), the islands take the brunt of the hurricane’s storm surge, diffusing it somewhat before the eye makes landfall on the mainland. They are also an important defense against tsunami, a real (if little-known) threat. Significant seismic activity has occurred in the Gulf of Mexico fairly recently. If global warming raised sea levels as predicted, most of low-lying Louisiana — as well as the critical barrier islands — would be underwater. The low-lying swampland of Louisiana, which has been receding for years now, is another natural barrier for the coast, as well as an environmental treasure. It too would be covered in water. The coastline would lose its natural defenses against hurricanes. And, as research is indicating, global warming would also intensify the hurricanes themselves. The EPA produced a series of pictures showing the coastal areas that are most at risk from global warming-induced inundation. Red indicates areas that are less than 1.5 meters above sea level. The images can be clicked on to show a larger view. It’s hard to see on these maps, but the barrier islands are the thin trail of red south of the main coastline. They would be underwater. More disturbingly, from the National Environmental Trust, here is a QuickTime movie of how Biloxi, MS (and its barrier island) would be affected by a rise in sea level. (WARNING for dial-up users: 3 MB file!) I’ve linked to the movie from this graphic I’ve made showing how the coastline would be inundated. 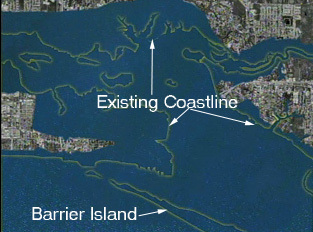 The barrier island protecting the city would no longer exist. Sure, the projection of the land would still exist underwater, and would serve to slightly lessen the impact of a storm surge, but it isn’t at all the same as having a true island above the sea. A dry, projecting landmass stops the flow of water, at least temporarily, and breaks the waves. A former island that has gone underwater obviously doesn’t keep the water from flowing. Also, as you can clearly see, the city itself would be partially underwater. This includes the glitzy new development that is taking place on this part of the coast in response to Hurricane Katrina — very shortsightedly, I ought to add. Whether this is because of the government of Haley Barbour, who is very likely a global warming skeptic, or because the businesses are aware of the risk but decided to hedge their bets, I do not know. The Katrina recovery and rebuilding process is not taking global warming into account at all. When the next really bad hurricane strikes, its impact could be compounded by the effects of global warming. The coast will be farther inland due to rising waters, there will be fewer natural barriers, and the hurricane itself is likely to be stronger and wetter than it would be without global warming. And, as unfortunate as it is for me to say this, at this point it’s not enough to simply drive less, replace incandescent light bulbs with fluorescent, cross our fingers, and hope that we’ve stopped the problem. I absolutely support cutting carbon emissions. If we don’t, the consequences will be even more horrendous than the scientists are daring to predict right now. But we’ve reached a point where it would be nothing short of grossly irresponsible to fail to look into preparation for the potentially disastrous changes that we have brought upon ourselves. When I first watched An Inconvenient Truth, I went to the special features on the DVD and watched the follow-up interview with Al Gore. He spoke about recent research about global warming that had come out since the shooting of the film, such as information about a link between hurricane intensity and global warming. But far more disturbing than that was a discussion of how global warming could cause the tundra to thaw enough to release methane and carbon dioxide into the atmosphere, further compounding the problem. Think of it as twisting the cap too fast on a soda bottle that has been shaken. After that seal is broken, the carbon dioxide in the bottle rapidly bubbles up, and nothing can stop the inevitable horrid mess. You just want to get out of the way of it. Obviously, that’s not an option for us if the permafrost thaws. But I wanted to see for myself. Gore’s interview didn’t go into great detail about what might happen if this occurred, and I wanted to see just what the ramifications of it could be. A temperature increase of merely a few degrees would cause these gases to volatilize and “burp” into the atmosphere, which would further raise temperatures, which would release yet more methane, heating the Earth and seas further, and so on. There’s 400 gigatons of methane locked in the frozen arctic tundra – enough to start this chain reaction – and the kind of warming the Arctic Council predicts is sufficient to melt the clathrates and release these greenhouse gases into the atmosphere. Once triggered, this cycle could result in runaway global warming the likes of which even the most pessimistic doomsayers aren’t talking about. An apocalyptic fantasy concocted by hysterical environmentalists? Unfortunately, no. Strong geologic evidence suggests something similar has happened at least twice before. The most recent of these catastrophes occurred about 55 million years ago in what geologists call the Paleocene-Eocene Thermal Maximum (PETM), when methane burps caused rapid warming and massive die-offs, disrupting the climate for more than 100,000 years. The granddaddy of these catastrophes occurred 251 million years ago, at the end of the Permian period, when a series of methane burps came close to wiping out all life on Earth. The great Permian extinction was nothing new to me. Although less famous among the non-geologist non-paleontologist set than the Cretaceous extinction that killed the dinosaurs, anyone who’s ever read many National Geographics knows about this event. And I knew it was probably triggered by a rapid change in climate. However… methane releases causing it? I had to see if this was based in fact. Well, it appears that it was. Continental drift: When the continents joined into one massive landmass, this affected the oceans, causing extinction of some marine life. However, it’s considered insufficient to account for close to 95% of life on Earth dying. Impact of a celestial body: An asteroid, meteor, or comet may have struck Earth, as happened at the end of the Cretaceous era. There is no direct evidence of this, though, and apparently everything claimed as evidence has fallen into serious question. Supernova: A star could have supernova’d relatively close to the solar system, causing radiation that would wipe of most of the life on the planet. It’s possible, but there is no astronomical evidence that one occurred. A spike in volcanic activity, causing global warming that disrupted the climate system, shut off oceanic currents, deprived the ocean of oxygen, and triggered the release of methane trapped in the sea. That Energy Bulletin article says that methane is far stronger than carbon dioxide as a greenhouse gas, and it would have caused an additional 5 degrees Celsius rise in temperature on top of what the volcanism-induced global warming had already caused. What’s more, there is considerable geological evidence to support this theory, as compared with the rest of the extinction theories. It’s all in the article, and it would amount to quoting the entire piece if I put the relevant parts here. It’s there; read it for yourself and be freaked out just as I was. Of course, nothing like that could happen again. Well, realistically, that probably is a doomsday scenario. It’s only happened once in the entire history of life on Earth, although there was another pretty bad event that took place in the Cenozoic Era. However, the central theory behind the foreign and domestic security policy of the United States has been to prepare for the most minuscule possibility of a worst-case scenario. Ron Suskind wrote a book about this idea called The One Percent Doctrine. I don’t know about you, but — without any intention of minimizing terrorist activity — as far as I’m concerned, the mass extinction of most life on Earth is a bit larger of a potential problem than a terrorist attack. If ever there’s an appropriate use of “the one percent doctrine,” it would be to prevent a mass extinction. In Al Gore’s interview about this problem, he says that “it’s not a good thing” when methane is released into the atmosphere. I would nominate that for understatement of the year.